WOOHOO! It's Saturday and if any of you are like me it's been slow going or NO going on the crafty time! But this week's challenge is FREESTYLE so time to get out something, anything!! and get our crafty on! Any color, any project just create! You will have until Friday night January 6, 2012 to get your creation linked below. What? Everytime I say, type, or write 2012 my mind feels like it's in twilight zone! I just love this paper and didn't want to cover much of it so I kept it VERY simple! I really like the way it turned out though! Border was cut from Elegant Edges using fit to length at 5". Card front: PTI Ripe Avocado 4 1/8" X 5 3/8", Enchanted Evening 4" X 5 1/4", DCWV the Cafe Mediterranean stack 3 3/4" X 5"
Happy Saturday!! And a very happy Merry Christmas Eve! The challenge this week, the 4th week of the month, is Mix it Up SATURDAY! You never know what you're gonna get! This time the challenge is: Use it or Lose it! Which means get out those older crafting items or use those new items that have never been used! Maybe you have something under the tree! You have until Sunday January 1st, 2012! to link up your creation to get entered into the monthly drawing this week. The challenge has been extended due to the latest of getting the challenge posted! OOPS! I used a Papertrey Ink banner die set that I bought a while back but have NEVER used, some twine, again NEVER used, and PTI stamp set 'Big Birthday Wishes' NEVER USED! I beginning to sound like I have too much stuff just sitting around!! Card front: PTI Pure Poppy 4 1/8" X 5 3/8", DCWV 'the Celebration Stack' 4" X 5 1/4"
I can't believe December is almost over and I'm just now getting the monthly giveaway posted! The winner will be posted January 8th! So keep those challenge entries coming! Thanks so much for so many of you participating in the weekly challenges! And if you are new here: first, Welcome! Welcome! I'm so honored and glad you are here, and second, if you don't know what I'm talking about we have weekly challenges posted every Satuday here on Hiding in My Craft Room with a monthly giveaway for one lucky participant chosen randomly. You can find the button and link in the far right side bar to the current challenge! If you have any questions please feel free to ask using the 'Contact Me' button at the top of the page. Here's a link with the challenge schedule and guidelines: Challenges! I've been working on some Christmas gifts that I can't share yet here! So I thought I would share some cards that I made at a couple of Close to My Heart parties, one at my house! I've become a CTMH groupie or something! I have a fantastic consultant who has even sponsored some giveaways here on my blog! If you don't have a consultant be sure and check out her page: The Craft Closet. There are some GREAT specials going on right now and you can even host an online gathering and earn FREE stuff! We used the CTMH Art Philosophy Cricut Cartridge on both. Here we used the Art Philosophy cartridge and one my favorite stamp sets 'Snowflakes'. Here we used the Art Philosophy cartridge for the frame and the Remarkable Wreath stamp set. Also, we used on the Kraft paper a spray bottle with Pearl Paint. Can you see the shimmer? I had to buy some of this! Happy Saturday!! And also Happy Birthday to my baby boy who turned 1 today! I can't believe it has already been a year! On with the challenge! This week is the 3rd week of the month, so it's Technique SATURDAY! Since this time of the year is so hectic I decided to make it something pretty easy: EMBOSSING! That can be dry, wet, using a scoring system, an embossing pen and light box (I'm showing my age!) Anykind of embossing! If you want to make it a little more of a challenge try to use more than one. On my example I used three different embossing folders. You have until Friday, December 23rd to link up your creation to get entered into the monthly drawing this week. I love how the embossing came out on the background. The Swiss Dots folder hit some of the silver parts of the paper (accidently) wonderfully! I had not emobssed Vellum before and I LOVE how it looks. Note: this is a Vellum Cardstock which is heavier/thicker than just regular vellum. Snowflake layers were cut at 3 3/4" from Art Philosophy! Frame layers at 4 3/4" from Elegant Edges. On this layer I (accidently) ran it through on the wrong side then ran it through again on the right side a couple of times to give is a 'different' embossed look. I've done this before and like the way it looks textured. Card front: DCWV 'the Winter Magic Stack' 4" X 4"
More Cricut Cartridges! Click on the name to see more pictures and information. You can see all the cartridge available digitally HERE. If you are not familiar with Papertrey Ink stamps: they are clear stamps that come with a CD case to store them on. This has been sooooo much fun! I hope you have enjoyed the 12 Days of Giveaways! Be sure and check out all 12 of the 12 Days of Giveaways! Click HERE to see the complete list! All winners will be chosen using random.org and posted on December 16th. So you have until then to get entered! If you're unfamiliar with Unity Stamps, they are pre-cut un-mounted red rubber repositionable stamps. You will need an acrylic block to use these. Be sure and check back tomorrow to see Day 12 of 12 Days of Giveaways! The last one! Be sure and check back tomorrow to see Day 11 of 12 Days of Giveaways! Here's the post with the complete write up: Making Cricut Mats Sticky Again! Be sure and check back tomorrow to see Day 10 of 12 Days of Giveaways! Today's the 8th! So it's time to pick using random.org the winner of the November giveaway! There were so many great entries for which I am so grateful. Hosting these challenges and giveaways for you is so much fun for me. I hope you continue to enjoy them too! Congratulations Melissa! Please use the 'Contact Me' button at the top of the page to send me your shipping information! Again, I hope everyone is enjoying the challenges each week as much as I enjoy coming up with them and posting them. Each month all the entries will go into a drawing and using random.org a winner will be chosen and posted on the 8th of the following month. I have a surprise that I'm going to be posting before the end of the month, hopefully closer to the middle of December! Remember to check out the current challenge and get a creation done and linked to enter the November drawing. You can see it by clicking on the 'Check out the Current HIMCR Challenge' button located on the far right side bar! New challenge will go up Saturday! Be sure and check back tomorrow to see Day 8 of 12 Days of Giveaways! PLEASE NOTE: The one pictured in Natural; however, the one for the Giveaway is NAVY! Be sure and check back tomorrow to see Day 7 of 12 Days of Giveaways! On the fifth day of Giveaways Hiding in My Craft Room gave away to me FIVE GOLDEN RINGS, just kidding! It's really a Cuttlebug set, Circles dies and Formal Circles embossing folders! The winner can make their own golden rings! Be sure and check back tomorrow to see Day 6 of 12 Days of Giveaways! Be sure and check back tomorrow to see Day 5 of 12 Days of Giveaways! Today starts a new month of challenges! I hope everyone liked last month's challenges and were able to find some crafty time to play along! The challenge this week, the 1st week of the month, is a Color Challenge: Monochromatic Blues! Neutrals can be added too. I made mine a Christmas card because this time of year I hardly have time to work on anything else, but you can make it anything Blue! A card, a tag, scrapbooking page/s, ATC, gift package, etc... You have until Friday, December the 9th to link up your Blue creation to get entered into the monthly drawing this week. I will be posting the December giveaway bundle December 9th after announcing November's winner on the 8th. I can't wait to see all the pretty blue creations! 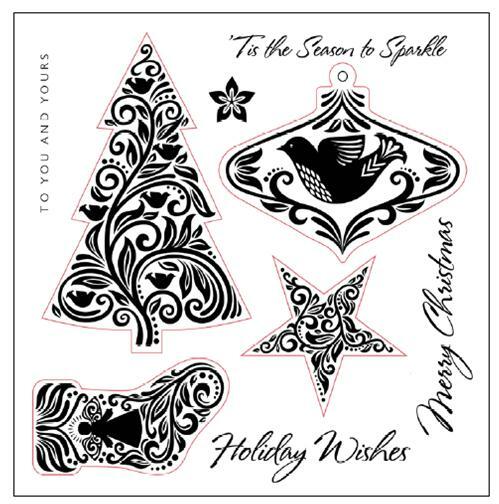 Snowflakes were cut at different sizes according to Snowflakes coordinating CTMH stamp set. Card front: SU Bashful Blue 4 1/8" X 5 3/8", DCWV the Winter Magic stack 4" X 5 1/4"
I'm not a Hannah Montana fan. GASP! BUT I love my cartridge and all the images! Be sure and check back tomorrow to see Day 4 of 12 Days of Giveaways! Be sure and check back tomorrow to see Day 3 of 12 Days of Giveaways! Thanks for checking in today and Good Luck! 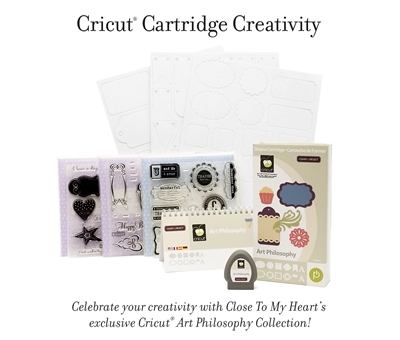 The stamps with a red outline (showing where the cut will be) coordinate with the Cricut Art Philosophy cartridge!! Be sure and check back tomorrow to see Day 2 of 12 Days of Giveaways!